Beck Cultural Exchange Center, Inc., a primary repository of Black history and culture in East Tennessee, was established in 1975 and 2015 marks our 40 Year Anniversary! To celebrate this tremendous milestone Beck is inviting the entire greater community to join us in commemorating the Eighth of August at Chilhowee Park on Saturday, August 8, 2015. Beck is the storehouse of African-American history and, Beck is unique in that, of all of the black museums across the country, none has the collections that Beck Center has; not one can come close. The Beck Museum is a beautiful spacious and magnificent facility, which has a vast collection of both Permanent and Feature Exhibits. The exhaustive collections that Beck has and continues to amass allow the museum to rotate exhibits on an ongoing basis without end. Beck is a must see historical, educational and cultural experience and is a major tourist attraction. Since the founding of Beck, our broad cross-section of exhibits, artifacts, and, memorabilia, captured in a variety of styles and formats, have captivated the interest of visitors of all ages. The KMA’s predecessor, the Dulin Gallery of Art, opened in 1961. By the middle 1980s the gallery had outgrown its quarters in the 1915 Dulin House, a landmark design of John Russell Pope. An ambitious community effort raised $11 million for a state-of-the-art facility overlooking the site of the 1982 World’s Fair in downtown Knoxville. In March 1990, the Knoxville Museum of Art opened in its current 53,200 square-foot facility, designed by renowned American architect Edward Larrabee Barnes. The exterior of the four-story steel and concrete building, named in honor of Jim Clayton, the largest single contributor to its construction, is sheathed in locally-quarried Tennessee marble. 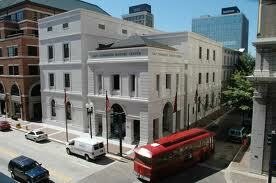 The Museum is located at the East Tennessee History Center in the heart of downtown Knoxville, directly across the street from the Tennessee Theatre and just blocks from other historic attractions, such as Blount Mansion and James White’s Fort. Open seven days a week, the Museum has been developed to capture the interest of a wide range of audiences. For instance, the interactive displays found in the signature exhibition, Voices of the Land: The People of East Tennessee, allow visitors the opportunity to not only be in the presence of original artifacts that stood witness to the region’s past but also to hear first-person accounts of what life was like, all amidst a backdrop of compelling, historic imagery. The Museum mounts a number of changing exhibits throughout the year, too, each of which focuses on a unique aspect of East Tennessee. To find out more, click here to go to their website.